Welcome to Mid-State Painting & Remodeling. Mid-State Painting is a family owned and operated business with over 30 years of painting and remodeling experience. We are fully aware that times are tough right now and every dollar you spend you want to feel comfortable knowing it was spent wisely. That is why we keep our pricing competitive and make sure you get every penny’s worth. Have you thought about selling but the market doesn’t justify it right now? Call us; we can make your home look and feel like new. All work to be performed is explained to your complete satisfaction and understanding so that you know exactly what to expect with no hidden surprises. All estimates are given directly by the owners of our company. For a complete list of our services click on the button below. 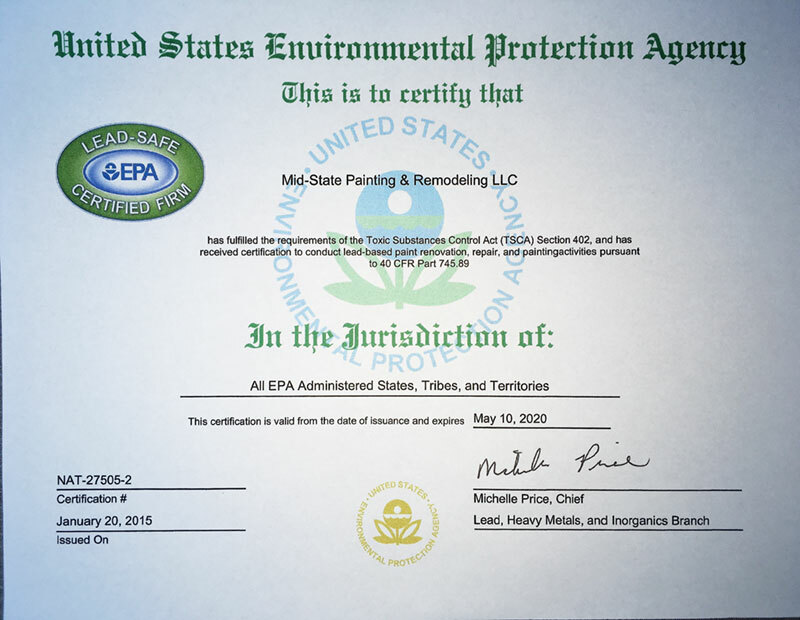 Mid-State Painting and Remodeling is a proud member of the Environmental Protection Agency. For useful information on what you should know about lead and your home please visit this page here. 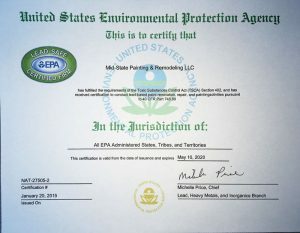 Our company is certified and licensed with the EPA. We have fulfilled the requirements of the Toxic Substances Control Act and received certification to conduct lead-based paint renovation, repair and painting activities. Contact us today for a complete and free estimate.